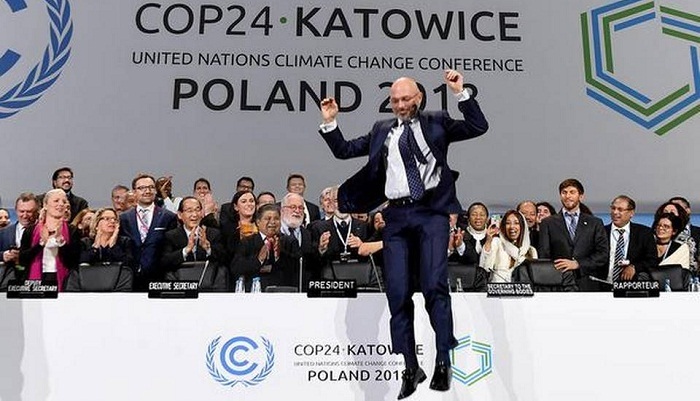 But states already dealing with devastating floods, droughts and extreme weather made worse by climate change said the package agreed in the mining city of Katowice lacked the bold ambition to cut emissions the world needed. Egyptian Ambassador Wael Aboulmagd, chair of the developing nations G77 plus China negotiating bloc, said the rule book saw the “urgent adaptation needs of developing countries relegated to a second-class status”. The final decision text was repeatedly delayed as negotiators sought guidelines that could ward off the worst threats posed by the heating planet while protecting the economies of rich and poor nations alike. “Without a clear rulebook, we won’t see how countries are tracking, whether they are actually doing what they say they are doing,” Canada’s Environment Minister Catherine McKenna said. French President Emmanuel Macron, who has recently backed down on anti-pollution fuel tax hikes in the face of countrywide protests, said France must “show the way” as he welcomed the progress made at the talks. Another contentious issue was the integrity of carbon markets, looking ahead to the day when the patchwork of distinct exchanges — in China, the Europe Union, parts of the US — may be joined up in a global system. The Paris Agreement calls for setting up a mechanism to guard against practices such as double counting emissions savings, which could undermine such a market. Delegates eventually agreed on Saturday to kick the issue down the road until next year. Most nations wanted the findings of the Intergovernmental Panel on Climate Change (IPCC) to form a key part of future planning. It had highlighted the need to slash carbon pollution by nearly half before 2030 in order to hit the 1.5°C target. But the US, Saudi Arabia, Russia and Kuwait objected, leading to watered-down wording.